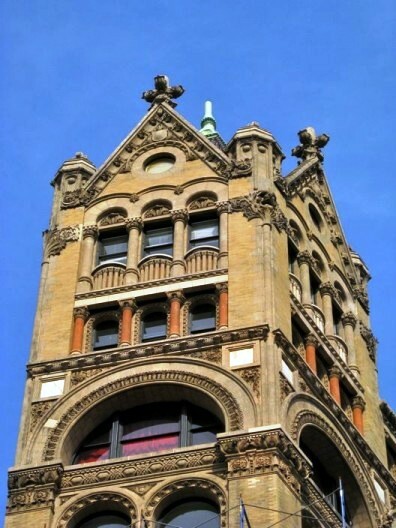 Victorian architects viewed themselves as the rightful heirs to all the historic styles that preceded them and late 19th Century buildings were sometimes referred to as “a happy combination of styles.” Perhaps nowhere is that more apparent than in Robert Henry Robertson’s 1892 McIntire Building. Despite the rustic surroundings, McIntyre’s business grew, as did the Broadway neighborhood. By 1890 he had grown wealthy and had a second large pharmacy at 992 6th Avenue. 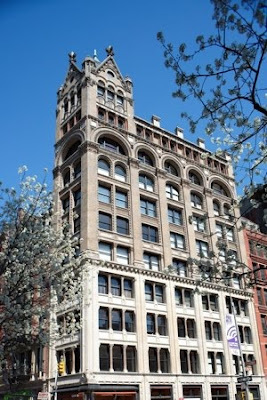 Realizing the potential of the burgeoning Broadway commercial area, McIntyre commissioned Robertson in 1890 to design a spectacular office building with rental space on the site of his 874 Broadway store. 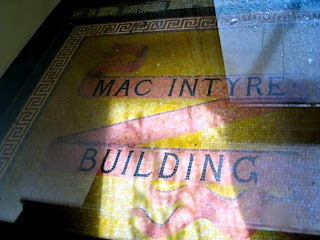 Two years later the McIntire Building was complete. 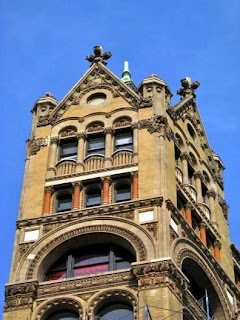 The often-fearsome architectural critic Montgomery Schuyler at once loved it, calling it “unscrupulously picturesque.” The McIntyre Building, he said, was “one of the most effective bits of our street architecture. . . with the long colonnaded attic and the picturesque corner tower. 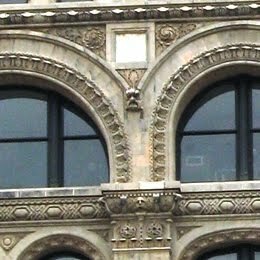 . ."
Robertson blended yellow brick, terra cotta, and carved stone, along with a clay tile roof to create the structure that so confuses architectural historians. Tagged variously as Gothic Revival, Romanesque Revival and Victorian Eclectic it is a wonderful hodgepodge of visually pleasing elements. McIntyre’s real estate gamble paid off. A fantastic building in a prime location, it filled with diverse businesses. A bank opened on the street level and in 1895 the Raritan Hollow and Porous Brick Company was headquarters here. The firm provided "fireproof" building materials for such structures as the Schribner Building and the New York Stock Exchange. The National Gramophone Company had its headquarters here in 1898 and in 1905, S. Herzig & Company, manufacturers of petticoats and women’s underwear was here. In 1931 the Central Hanover Bank and Trust had taken over the ground floor while the rest of the building was mainly leased to china and fabrics wholesalers. In the 1970s the McIntyre was purchased by a cluster of artists who moved in, despite not having a certificate of residential occupancy. At some point an illegal nightclub called The Cobra Club operated out of the 7th floor. Not all of their snakes stayed in the glass terrariums. For several years afterwards live snakes were found slithering throughout the building. By 2000 the owners had legalized their co-op and a full-scale restoration was underway. In a surprising move, they contracted Restoration Management Services to restore the original wooden windows rather than replace them. Superstructures & Engineers Architects addressed the exterior walls and roofs, providing investigation and design input and earning the Lucy G. Moses Preservation Award from the New York Landmarks Conservancy. By 2008 the building was enveloped in scaffolding and netting as Skyline Restoration, Inc. managed a $2.5 million complete restoration. Today the scaffolding is gone and Ewen McIntyre’s spectacular building is a sensation again – even with a typo in the entryway (but no more snakes). Thank you for this beautiful history. My late grandmother's first job was held in the Central Hanover Bank at this location in approximately 1932, working at the switchboard and doing stenographer work. I am not a New Yorker but am visiting next week and I am eager to photograph this location. Sincerest thanks for documenting this gem, which to me has been hidden until now.